In the early 1970s, bands like Led Zeppelin and the Grateful Dead occupied the current rock and roll market. Horn bands influenced by Blood, Sweat & Tears and Chicago and progressive rock outfits inspired by Emerson, Lake and Palmer and Yes sprung up everywhere. Eric Carmen recognized that a huge void existed for the kind of music that he had admired, emulated, and played his whole life. He longed to be in a band that would lovingly trace the steps of his beloved '60s rock brethren, rekindling the glory days of the Beatles, the Who, and the Beach Boys. That year, Jim Bonfanti called. Eric and Jim were the brain trust behind this grand concept. Their new band would effect a head-on collision with the local progressive rock scene. Beards and 20-minute solos were out. Matching suits and a Beatles-flavored sound were in. Celebrating the timeless power of an immaculately crafted pop song, this new band, specializing in two-part and four-part harmonies, would prove to be the antithesis of the stoner hippie generation. The band's first official lineup included Eric on rhythm guitar and keyboards, Jim on drums, Wally Bryson on lead guitar and John Aleksic on bass—in lieu of Dave Smalley, the group's first choice, who was serving in Vietnam. History will record that the very first song Raspberries ever played onstage was "I've Got A Feeling" by the Beatles. It was October 16, 1970 at Cyrus Erie in North Ridgeville, Ohio. "The first important gig we played was at the Agora," remembers Eric. "On our first visit to the club, they had a band playing to a crowd of about twenty people in a club that could hold upwards of 1,500. We told the owner that we wanted to play there and that we wanted Sunday nights. Within a short six weeks, we were pulling more than 1,000 people a night. It was magical. We owned the place." Without question, Raspberries were destined for greatness, but their long journey to stardom was only beginning, with one member left standing at the side of the road. By March of ‘71, John Aleksic was out of the band. "John Aleksic was in the band for three months," says Jim. "He was gone by the end of the year. That following April, Dave was home from the service, so he joined us." 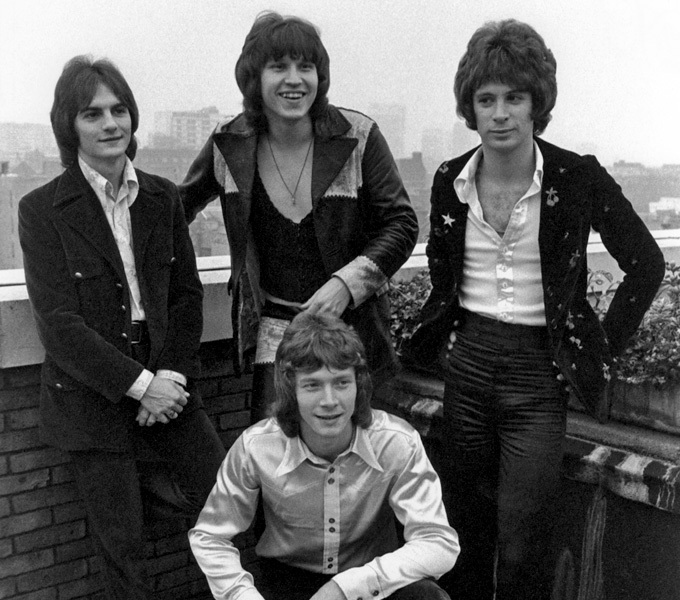 On May 5, 1971, Raspberries played their first gig with Dave and over the next few months, they honed their stage act and wrote original material. They had high hopes that their original songs might be the spark needed to ignite a national fuse. Traveling together with the demo tape in tow, their managers spotted producer Jimmy Ienner in New York City's Grand Central Station. Ienner had an ear for hit singles and had a number of successful records under his belt. Jimmy didn't want to take the tape with him nor would he give them an appointment. So instead of a formal meeting, they literally pushed Jimmy into a small record shop at the train station and played him their demo tape. Jimmy liked what he heard. Raspberries blew Jimmy Ienner away. Returning to New York energized, he was on a mission to land Raspberries a recording contract. In no time, he lined up several major labels willing to give his new find a listen. A bidding war ensued and in the end, Raspberries signed with Capitol Records, the home of the Beatles and the Beach Boys. As 1971 drew to a close, Raspberries packed their bags and headed to the Big Apple to record their first album. And now, only one thought was racing through Eric's mind: "I want a hit record (yeah!)." Most of the songs slated to be recorded for their first Capitol effort had already been written. So when they packed up their gear and headed off to New York City in the winter of 1971, Eric, Jim, Wally and Dave knew what they needed to do: capture on vinyl the sound that made them the hottest band in Cleveland. Scanning the bookrack of his local drug store, Eric spotted a paperback by an author named Dan Wakefield titled Going All The Way. He thought it would make a great song title. He was right. Still, recording the song was not without its problems. Everyone was unhappy with the initial takes on the track. Each take was deemed too flat, too "vanilla." Eric was perplexed: "I remember begging to keep 'Go All The Way' off the album because I was so disappointed with how it turned out. When I brought the song to the group I explained to them it was either going to be banned or a top ten hit. I figured that if I could ever get it on Top 40 radio it would have to be a hit. As a last ditch effort to save "Go All The Way," they put the song through a limiter and it came alive—like what you heard on the radio. Jimmy Ienner looked up from the console and said, "Man, this thing sounds like a #1 record!" With that burst of inspiration, the Raspberries' biggest hit was born. "Go All The Way," as Jimmy Ienner predicted, became a million-seller hit record and Raspberries' first gold record. As for the LP, it LP garnered terrific reviews, with Rolling Stone raving, "Raspberries opens with the finest burst of lightweight English rock I've heard all year, a raunchy 16-bar guitar intro. The rest of the album is just as ephemeral, and just as good. What makes this album easy to recommend is the fact that there really isn't a bad cut on it. Raspberries is composed 'in toto' of potential hit singles, all with excellent vocals and terrific production." “Sitting on top of the world, with a hit album and a million-selling single, Raspberries began planning for what would be their second Capitol LP, Fresh. "I remember sitting in my apartment, in Euclid, Ohio," remembers Eric, "with nothing but a piano and my stereo system. I wrote 'I Wanna Be With You,' 'Let's Pretend,' and 'I Reach For The Light' in one weekend—not bad. My goal on that album was to try to have a certain cohesiveness among the styles of the different writers." In early 1973, Capitol sent Raspberries on a goodwill tour of Europe. They appeared on a number of radio and TV shows and conducted press interviews in several European cities. "We did a lot of TV in Germany," recalls Jim. "We played live in Cannes, France and on an Armed Forces Radio Network show in Frankfurt, Germany." On Side 3, the songwriting contributions of Eric, Wally and Dave blended to produce a stellar creative outing for the band. "We felt the constant description of Raspberries as a singles group was misleading," Eric said in 1973. "We have three completely different writers in the band, do all original material, and feel we are definitely an album group. We are extremely grateful over the success of our first two albums, but we don't think either one captured our true sound. The new album is what we're all about. The studio won the first two battles, but Raspberries came out on top on Side 3." Hoping to broaden their media profile, Raspberries appeared on more television shows, including Don Kirshner's Rock Concert, The Midnight Special, Flipside and Go!, which featured a behind-the-scenes look at the band in the recording studio as they cut tracks for Side 3. Perhaps Raspberries' crowning achievement was their headlining appearance at New York's Carnegie Hall on September 26, 1973. "Carnegie Hall was, by far, Raspberries' best date," admits Eric. "It was a time when everything—all of the stars and planets—just all lined up. I was very aware when we got the booking that this would be a really incredible moment because we were going to stand on the stage where the Beatles played, where Rachmaninoff played—the same stage, the same hall. You just don't get to do that very often. And a lot of people don't get to do it at all. I can remember the curtain going up and hearing Wally's Rickenbacker and Jim's drums fallin' in. It was just picture perfect. And the audience was dead quiet! You could literally hear a pin drop. It was a great performance, the band was well rehearsed, and the set was carefully constructed. We blew the place apart." Eric, Wally, Jim, and Dave's last appearance together was on The Mike Douglas Show. They performed "Go All The Way" and "I'm A Rocker." "Dave and I left the band on the first Monday after Thanksgiving," says Jim. Tensions grew between the band members and they soon found themselves moving in two distinctly different directions. It was inevitable Raspberries would have to think long and hard about starting over. Michael McBride, who had previously played drums in Eric's pre-Raspberries band Cyrus Erie, and an eager young bassist from Nebraska named Scott McCarl, who got the gig by sending Eric a demo tape, replaced Dave and Jim. They went on to record the group's final LP aptly named Starting Over, which yielded a Top 20 hit, "Overnight Sensation (Hit Record)." More popular than ever, Raspberries are championed as the quintessential power pop band. Performing together for the first time in over 30 years, fans from around the globe had the rare opportunity to witness firsthand the transcendent power and electrifying appeal of Raspberries live onstage. The reunion tour was a resounding success, and for those fans who were lucky enough to witness it, a dream come true. "Go All The Way" was released on May 22, 1972. It's been 30 years. When's the last time you listened to the song? I haven't actually sat down to listen to it in the past, I don't know how many months, but there is a certain freshness when I hear it on the radio. It still sounds novel. It doesn't sound like other stuff. I went back and re-read Shelley Yackus' interview that Ken Sharp did for the Raspberries book (Overnight Sensation: The Story of the Raspberries). Shelley, who worked with Jimmy Ienner and engineered the album, was talking about "Go All The Way," and his story was right on the money. It's exactly what happened? I remember vividly what happened because it was my song…and I remember being in a back room somewhere at the Record Plant getting on my hands and knees begging, "Please. Please don't put 'Go All The Way' on the album. I beg you. It's so awful the way it is. I will go home and I will write an instrumental and we can cut it in ten minutes, but don't put this on the album." It was the song that I had the highest hopes for and it was just a dead fish. It was our first time in the studio…a real New York studio with an official producer, engineers and whatever, and I think everybody played it a bit timidly…except for Wally on lead guitar and maybe the bass part. Yeah. I was the bass player on that, and on the recording, Jim's drums sounded really light and Dave's rhythm part was almost non-existent. Well, they had this Roger Myer limiter that they called the "Oscar Meyer." They had tried this very violent limiter on other songs and other bits and pieces of songs and it was so violent that it wouldn't work on anything. As it turned out, it just happened to pulse exactly in time with "Go All The Way." It was just that odd coincidence that made the record. In the Tom Hanks movie "That Thing You Do," there's a great scene where the band hears their song for the first time on the radio. Do you have a similar memory with "Go All The Way?" I do remember hearing it on the radio for the first time and being pretty darn excited about it. It was obviously thirty years ago so I don't remember it clearly but I do remember that we were all pretty darn excited. It was our first album, and the first single ("Don't Want To Say Goodbye") had made the charts but not set the world on fire. I had always thought that "Go All The Way" should have been the single and I never understood why Capitol had chosen to release "Don't Want To Say Goodbye" instead. It kind of flew in the face of all of the logic in the record business at the time. So, when they eventually pulled that back and decided to release "Go All The Way," I thought, "All right. Come on!" And when it took off, I can tell you, it was a very exciting thing. I mean, I was a twenty-two year old kid, hanging out at the beach here. Hard to imagine, but we actually have beaches here in Cleveland. It was a great time, and brings back some great memories. It's hard to believe it's already been thirty years since "Go All The Way" was released. Wow! Amazing.